Newly admitted into the University of Benin? Congratulations! We the light of Christ Community. 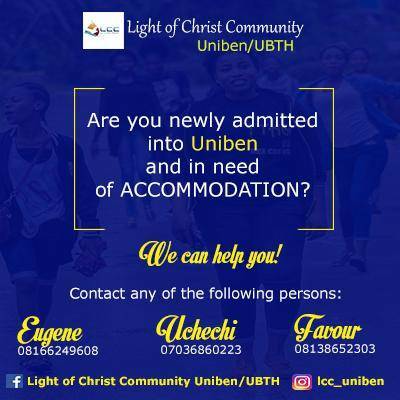 We are a student community/fellowship in University of Benin/UBTH. We understand the demands of coming into the university and we planned ahead to be of help. We are offering free temporal accommodation to students. Not just that, you can do all your online applications, like clearance, school fee, acceptance fee payments and document upload with us for free. And sure, you will need guidance on issues relating to your field of study and possibly directions here and there. No sweat, we thought about all that already. We can help you!